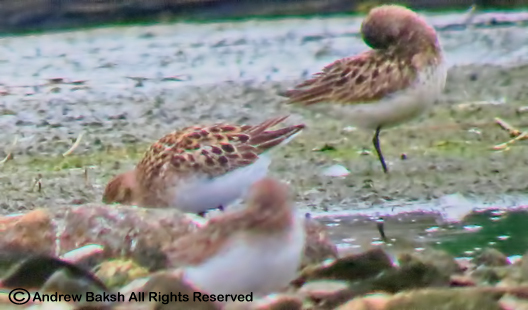 Here are a couple of photos of the American Avocet (Recurvirostra americana) that I found at Jamaica Bay on July 16th, that only stuck around for that day only. This bird retaining nice breeding plumage, appeared to be a female showing a slightly more upturned bill than is seen in the males. Yep, I like em unique looking and colorful and...wait a minute. What did you think I was talking about? I am talking about birds people. Okay, now that we are refocused; lets get back on track with the subject at hand. 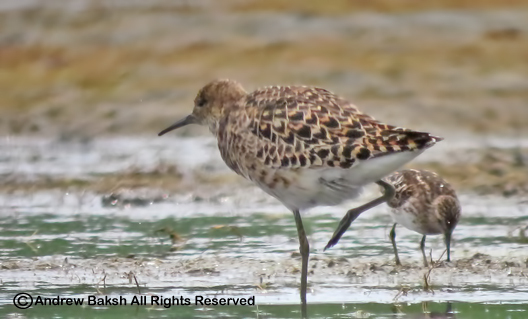 Below, are a few photos of another interesting peep that I photographed at Jamaica Bay Wildlife Refuge in Queens NY. After some review of reading material and video + photos that I took, I am leaning towards... Wait, did you think I was going to make it that easy for you? Well the truth is, I am not sure myself. Take a look at the images and weigh in with your ID and why. Please don't be shy about posting your comments, this is how we all learn and I am learning as I go. As I gathered my notes to write this post, I remembered that as I entered the East Pond that day, I had paid homage in my mind to the birder Tom Davis. While I never had the privilege of meeting the man, his love for shorebirds is legendary. So Tom, wherever you are this one was for you!! On Sunday, I got to the North End of the East Pond fairly early, but not early enough as I detected a couple of birders that I knew ahead of me. Invoking good birding etiquette I hung back not wanting to flush birds on the pond if I moved in and also giving Corey and Seth their space. More importantly, I wanted to take a moment at the entrance of the pond to listen to the sounds of the shorebirds in the morning stillness, it is one of my favorite things to do on the East Pond - I and the shorebirds, is how I like it! 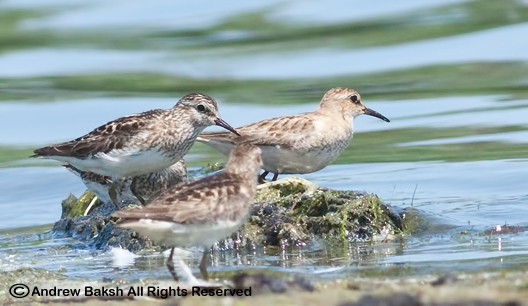 Stilt Sandpipers feeding on the East Pond at Jamaica Bay Wildlife Refuge. I spent a good hour working the area just at the entrance of the North End of the East Pond. 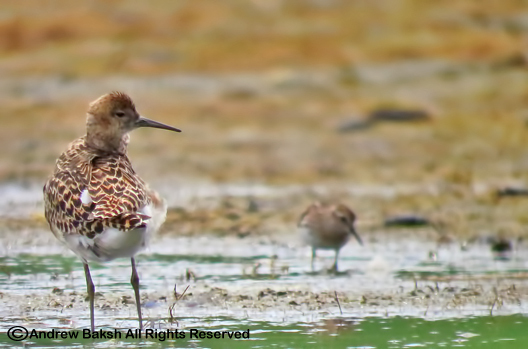 There were lots of shorebirds to sort through and I was enjoying watching the Stilt Sandpipers (Calidris himantopus) feeding. Just in that area alone, I counted 17, so I knew my previous day high count of 23 was likely to be surpassed. 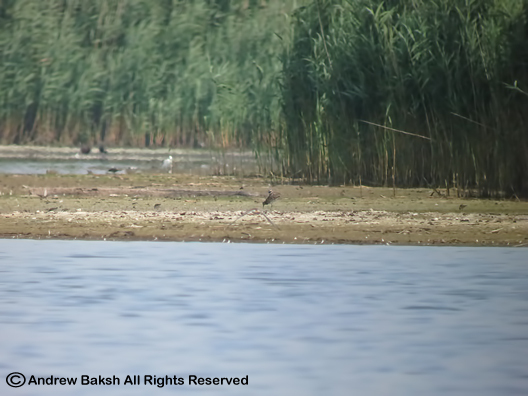 Before I moved further in on the West Side of the pond a few birders came onto the flats. Karen Fung, Matthew Rymkiewicz and another birder I learned later to be Ben Cacace. Karen and Matthew I knew, but it was my first time meeting Ben. 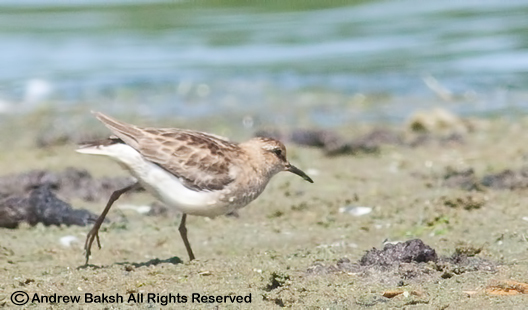 I learned that Ben was hoping for the Ruff (Philomachus pugnax), which was a life bird, so I encouraged them to move on in and search the usual spots. I continued watching and enjoying the views of the birds at the North End entrance, when two other birders, Isaac Grant and Gene Herskcovics entered onto the flats. They too were looking for "Rufous Ruff" more so for Gene and so I suggested they move in. Scoping down the pond all the way south, I wondered if there were birds on the South End of the pond. I was sure they were, but was anyone working that area? Knowing that the North End had enough coverage, I decided I was going to bird the South End. It was starting to heat up and I knew it was going to be an arduous task working my down the pond from the South End, but I kept thinking that there is a good bird somewhere on the east side of the pond and we are missing it. I had to do it! 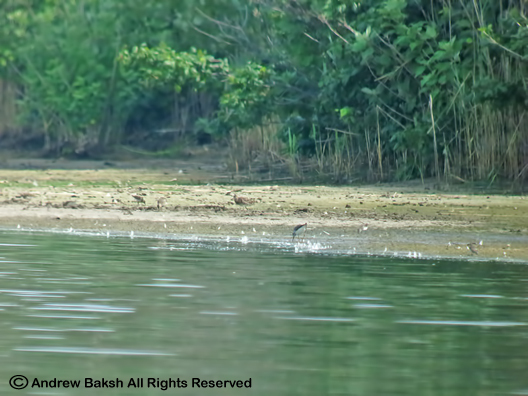 Juvenile Spotted Sandpiper - note the upperparts and tertials with dark subterminal bars and white tips. On principle, I birded the West Pond before entering the East Pond from the South End and began the schelp up the east side of the pond. There were some birds right at the entrance and some on the Raunt, but not much. Nevertheless, I took my time checking - working every bit of open mud flats on both my side, the east and across from me, the west side of the pond. 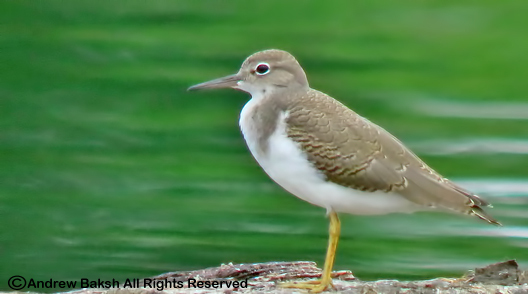 Along the way I stopped to digiscope a young Spotted Sandpiper (Actitis macularia) and other birds such as a molting Green-winged Teal (Anas crecca ) and a Brandt. Once I passed the Raunt, the shorebirds numbers began to increase and it slowed me down further as I carefully worked over the many peeps feeding on the open flats. Carefully working my way through one of the last soft spots under water I came up to a stretch of flats that curved in on the right into a small cove. It was almost opposite to the area on the west side of the North End where "Rufous Ruff" used to hang out. 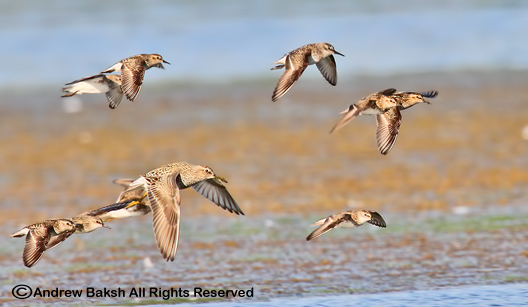 There were lots of shorebirds feeding in the area, so I settled in and began to sift through the flocks of birds. 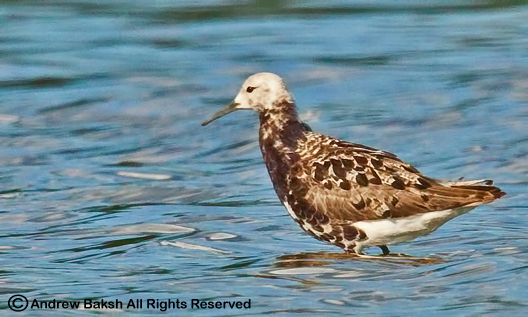 My first look of what was confirmed to be the 3rd Ruff of the year for Jamaica Bay. 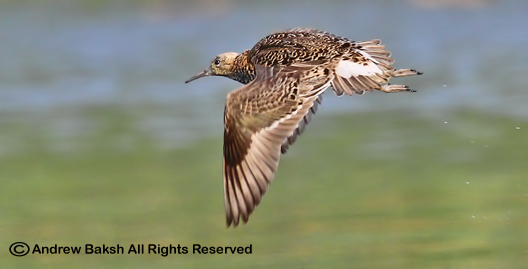 I worked over the nearest birds a few times before scoping further north when I picked up a familiar shape in the distance; there you are I whispered, thinking I had "Rufous Ruff". But he looked odd, looking smaller and his plumage was well...could he have undergone a drastic molt within a few days? The angle was poor and so I shifted to my right trying to get the sun behind me and I looked again. Something was not right. I looked at this bird closer and I felt a sense of Deja Vu. 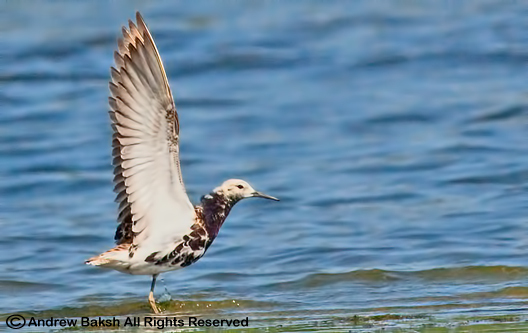 Rufous Ruff, clinching that I had found yet another Ruff on the East Pond at Jamaica Bay. Was this like Independence Day when Tom Burke and Gail Benson first encountered "Rufous Ruff"? (I could almost hear Shai Mitra's voice in my head, "focus lad focus") Another Ruff? No ! @#$$% way! I grabbed my point and shoot. It was going to be a distant digiscope shot with poor angle for light, but I needed a documentation shot. 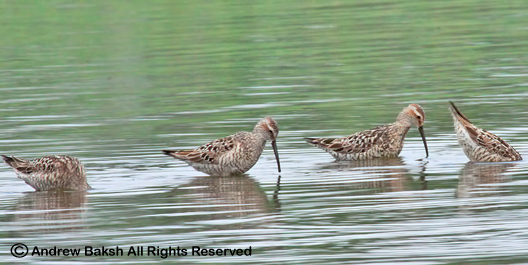 I took 2 shots, then I thought, that I needed to find "Rufous Ruff" to clinch whether I was looking at another Ruff. I still wasn't sure! Distance and light can be tricky and I was being cautious. 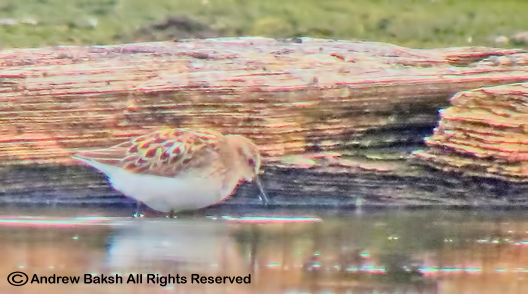 Lucky for me, "Rufous Ruff" was just a few yards further north and once I had him in the scope I was confident, that we had Ruff number 3 on the pond. Blistering Barnacles!!! 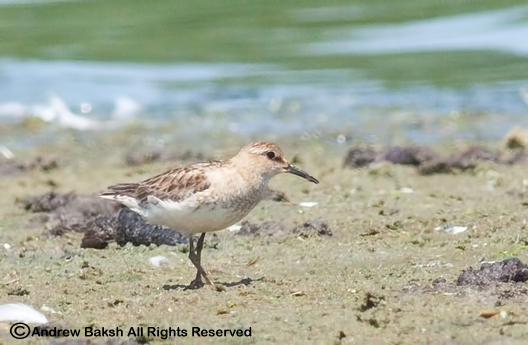 I got back on the new Ruff and looked at the bird again noting the plumage and lack of "Ruff"...a female I thought, thinking of the Ruff/Reeve I had chased in Connecticut. Keeping my eye on the bird in my scope, I reached for my phone. 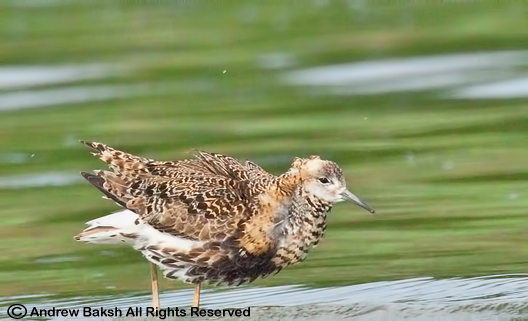 Female Ruff - Reeve on the East Pond at Jamaica Bay Wildlife Refuge. As I worked my way north, I had kept a watchful eye to see who remained on the other side of the pond and knew that Karen Fung Matthew Rymkiewicz and Ben Cacace were the only ones besides myself, still cooking in the sun. I had Karen's number and so called her. After what seemed too long, Karen answered. I got right to the point, telling Karen I had found another Ruff then proceeded to give her directions on where to look. Karen relayed my instructions to Matthew and Ben and after a bit they picked up on the bird (seconds could seem like eternity in situations like this). Satisfied that they were on the bird, I decided to get the word out via an e-mail to the list serves. With the knowledge that this was not the first Ruff of the season, I decided not to waste time on making individual phone calls save one to Seth Asubel. Then I moved in. I wanted closer looks and more documentation shots. The Reeve was on the move, wandering further north away from me and then suddenly flew towards the North Island. I watched her in flight and it was easy to track her as she landed near one of the spits protruding from the Island. I called Karen and confirmed that they too had seen her fly and had tracked her to the new location. Satisfied that other eyes were on the bird I continued working north, but when I stopped to look for the Reeve near the North Island I could not find her. A phone call to Karen revealed that the Reeve had moved again and this time she had given us the slip. I worked my side and Karen and co. worked the other side for almost an hour without any sign of her. I had made it all the way to North Island and decided that I might as well continue down to the end and cross over to the other side, when the phone rang. It was Karen, they had the Reeve near the entrance to the North End and were on the bird. I scoped the area they were looking at and picked up on the bird. I was happy, we had the bird again and now hopefully others would see it too. A few minutes later Karen texted me to indicate that she had enough of the sun and was packing it in. Karlo Mirth, who had joined the group was the only one on the bird. I asked Karlo to stay on the bird while I made my way out the North East end of the pond and walked the short distance to the North West end. Karlo was a terrific help!! He stayed on the bird until I made it over and I finally got close up extended views of the beautiful Reeve! Karlo soon departed and so did the Reeve, flying south. I took a much needed break for water and rest, but gave it another round in the afternoon where I refound the Reeve further south on the North End, getting more extended looks and photographs. 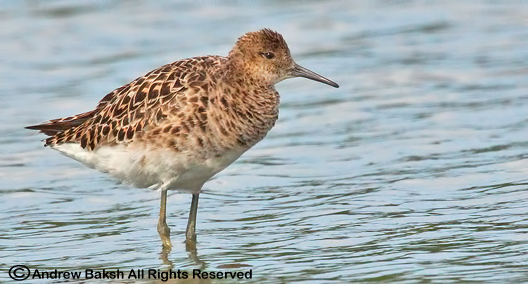 From my observations, this appears to be a female Ruff (however, there is always the possibility of this bird being the faeder type - see my Connecticut Ruff/Reeve post for more information), with her more elegant less bulky body and she is in breeding plumage. The leg color being a dull gray/greenish seems to indicate this could be a 1st year female? Though according to (Chandler pg. 284) the wing coverts are supposed to be worn to a plain brown-gray, which is not evidenced with this bird. I left the pond late, exhausted but very happy with the day's events. 3 Ruffs so far at Jamaica Bay, proving that if you build it, they will come!! Reeve on the East Pond at Jamaica Bay Wildlife Refuge. 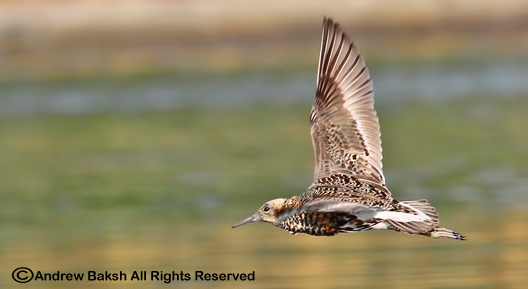 Known as "Rufous Ruff" or "Independence Day Ruff", the current star of the East Pond. Okay peeps, here is a rather easy one for you. Time to break out the field guide; take a look at the images below and try to identify the species. No hints! Good luck and please post your suggestions instead of e-mailing them to me. I don't give a damn that the spin doctors are trying to sell this as only a name change to the visitor's center and not the refuge. It should not happen!!!!! On June 12th, Congressman Bob Turner, held a press conference in front of the Jamaica Bay Wildlife Refuge Visitor Center which is part of the Gateway National Recreational Area- to announce a proposed legislation the Congressman is authoring- to rename the center to honor former New York Senator James L. Buckley. This is not good news at all for those who love Jamaica Bay and we had better stay alert because who knows what will follow next. What is the down side to all of this, well for starters, we lose the connection to Jamaica Bay and its WILDLIFE and the fact that it is considered a "Refuge". And who is James Buckley anyway? What was his contribution to Jamaica Bay? None I bet!!! If there is any name changing to occur, the name Herbert Johnson (the man who practically built the place) should be the only name for this consideration. For those of you in the New York area, (especially birders), don't sit on your backsides and whine about changes like this without doing something. Take action!! By calling the office of Bob Turner and or signing the petition. It may be a minor gesture, but at least you would have tried. 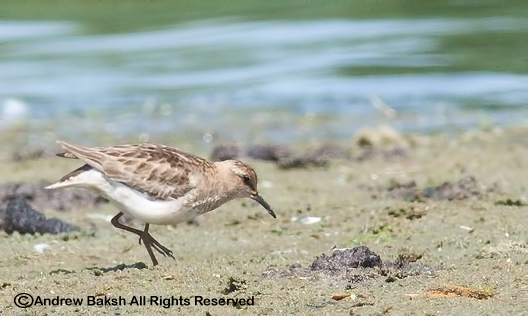 Least Sandpiper in transitional plumage or?? 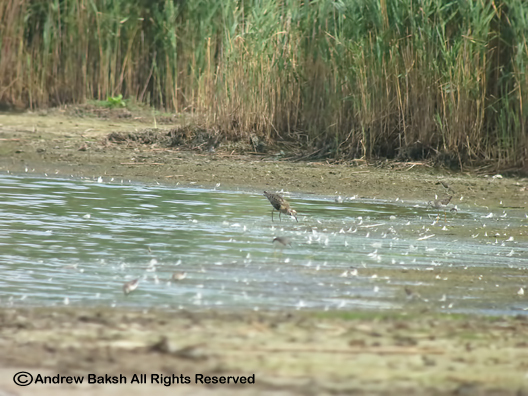 I spotted this peep on the East Pond at Jamaica Bay Wildlife Refuge today, not long after I found my first of the year Stilt Sandpiper. A few of us, including Seth Asubel, Phil Jeffery and Heydi Lopes began working through the field marks. 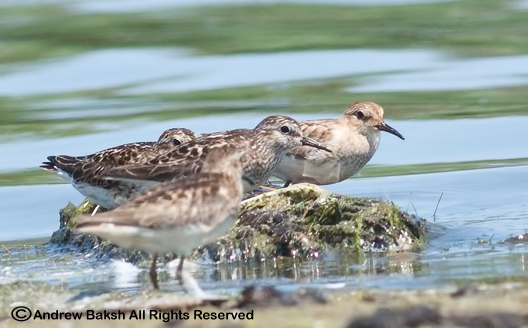 Initially it looked bigger than the nearby Least Sandpipers, but after studying it for a while we concluded it was comparable in size to a Least. Despite leaning towards Least, we were puzzled at the "buffiness" of the bird. Here are a few photos. What are you thoughts? 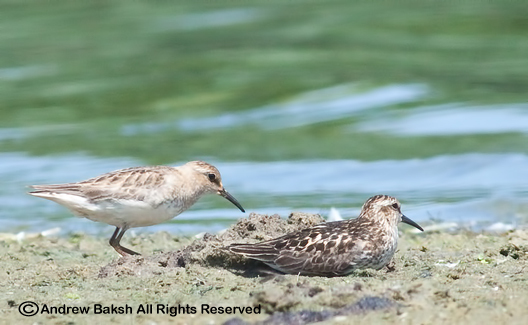 UPDATE: 7-10-12 The initial assessment of Calidris minutilla Least Sandpiper stands! Despite the aberrant plumage - the structure, virtually no primary extension and dark centers in the scapulars hold consistently for Least. Thanks to all who weighed in with their input especially Seth Asubel and Shai Mitra. 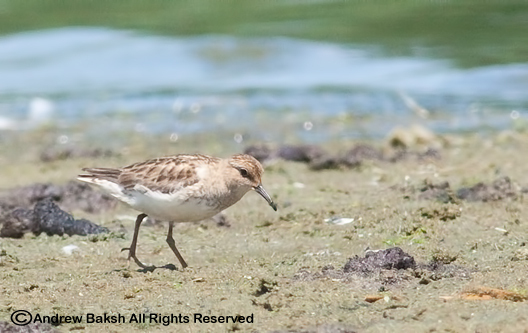 On June 30th, I had suggested to Heydi Lopes that I wanted to return to Jamaica Bay on the East Pond (July 1st), to see if there was any significant change in the arrivals of shorebirds. The day before I had visited the East Pond and had noted a turnover of shorebirds indicating birds were slowly arriving. I had been scouting the East Pond since the end of May and I was excited. National Park Service, specifically the Jamaica Bay unit had kept their promise and had begun to lower the water earlier than normal dates and I had tested walking onto the pond. It was looking really, really good for the early date. Heydi, I suppose trusting my scouting came out with me on Sunday July 1st and she did not regret her decision as we found a 1st year molting male Ruff (Philomachus pugnax), in an unusual plumage - an all white head. But I am getting ahead of myself here. Let me back up to how the Ruff happened. We had made our way into the north end of the East Pond walking on the west side of the pond all the way to what is known as "Dead Man's Cove" (or Mud Cove) a cove just after Sanderling Point, which is almost opposite the North Island. We had a good number of shorebirds on the other side of Dead Man's Cove, so we began to sift through the flocks and I began to count numbers for my shorebird survey. I had made one pass in an area and had circled back to give it another going over when my eye caught a bird with its back to me. It was preening and I could only see its back, but its legs looked long and the color, Gray/Greenish was what made me took a closer look. I zoomed in on the bird with my scope and it briefly raised its head. It looked like it was white! I was thinking maybe I made a mistake (lack of coffee perhaps...or bad light? ), so I worked the bird over and again I caught a bit of white, when the bird again very briefly raised its head. It looked like a vulture like shorebird. 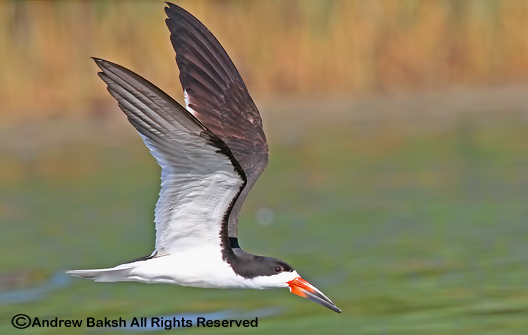 My pulse quickened and like I did with the Sandwich Tern at Mecox LI, I began to conjure up images in my head. The bird shifted a bit and I could now see part of the left side, "black feathers". Could it be a Ruff? No way, I was thinking. 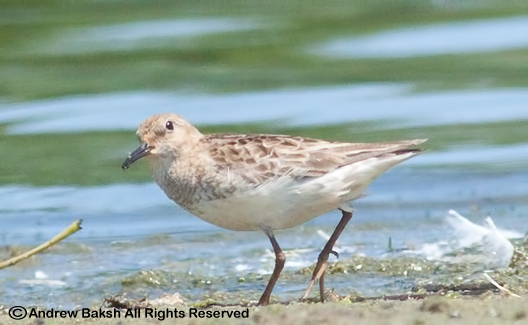 I had missed out on chasing the recent Ruff at Montezuma in Seneca NY and had mused that I may find my own in my home county. Did it happen? The bird then stretched its neck and I got a good look at its small white head short bill and the feathers fluffed out from the side of the neck. I whispered, to myself in disbelief its a %#$%^#^ "Ruff". Casually as I could (I still haven't gotten to the foaming at the mouth level like a certain shorebird aficianado birder that I know) without taking my eye of the bird I said to Heydi, "I think we have a "Ruff". Heydi responded in disbelief "what...no way"!! Then, I got her to look in my scope; it seemed an agonizingly long time during which I was at the point of telling her that I needed to get back on my scope to get a photo. Finally, she nodded that she had seen the bird. I got back on my scope to get another look and began to take notes; next I fired off some digiscope shots. Heydi meanwhile had found the bird in her scope and was reviewing it as well. I asked for her opinion on the call and Heydi agreed; I then asked her to stay on the bird while I grabbed my phone. Time to make the phone calls and to put out a post. Tom Burke and Shai Mitra were the first two people I called. Shai was at home and immediately went into response mode (think Mario Andretti on the Southern State Parkway). Tom was at Sterling Forest and I told him I was going to baby sit the bird until he arrived (that is what friends do because Tom would do it for me). 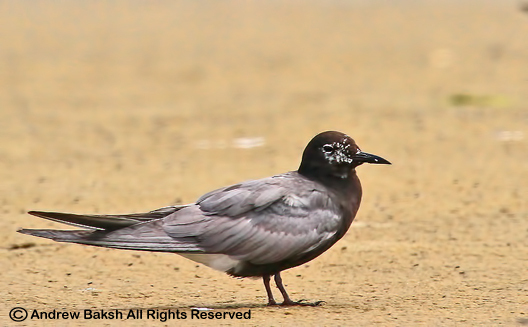 I then whipped up a post, which successfully made it out (I take back my swipe at smartphones...see the Sandwich Tern post) and made some additional phone calls. Satisfied that I had made calls to cover enough ground especially with folks without smartphones, I went back to studying and documenting the bird. The bird relocated and I got a bit nervous when we could not see it, but Heydi picked it up again as it wandered out from around one of the many smaller coves on the west side past "Dead Man's Cove". The bird kept on wandering in and out of sight, so Heydi and I decided we had to make it around the cove to keep a better eye on the bird. This was going to be tricky because the cove was still very muddy and one false move could put us in a sticky situation. Having navigated the cove many times, I took the lead and bushwhacked a path around the cove with Heydi right there with me bushwhacking along as well. We finally made it around and we cautiously moved into position where we could monitor the bird allowing it ample room so as not to spook it. The first to arrive were Shai Mitra and Patricia Lindsay. They quickly got on the bird and enjoyed the good looks even though the lighting was not the best. Next to arrive was the affable and shorebird foaming at the mouth aficionado Bobby Kurtz, who unfortunately in his haste to get to our location, took a dive into the cove (thank you for being the 1st of the year sacrifices - the East Pond Gods demands it). Bobby turned out to be okay and with his muddy self joined us in our observation of the bird. Tom Burke, Gail Benson and Andy Guthrie arrived shortly after and they too got on the bird. Additional birders soon also arrived and they joined the group of observers. Finally, after Doug Futumya arrived and we observed the bird with him, Heydi and I left the pond, happy but wanting to take a break from the sun. We returned later in the afternoon, where surprisingly we had the pond and the bird to ourselves and we were able to do additional studies and documenting. 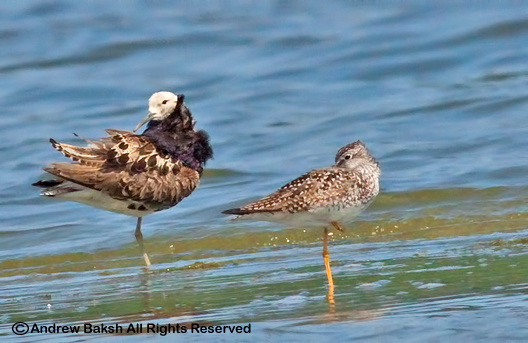 According to the NYSARC (New York State Avian Records Committee) archives, it was six years since a Ruff was seen at Jamaica Bay. How cool to be involved in finding one! 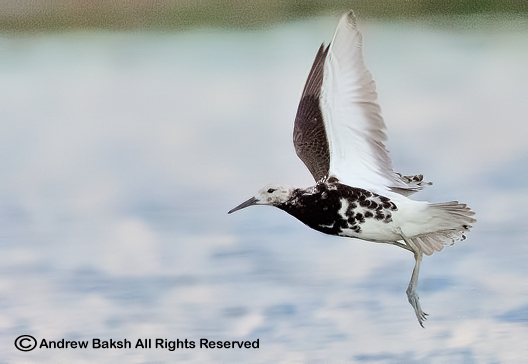 I was extremely happy that we had found such a neat shorebird, a state bird at that, on the East Pond, at a place I love dearly...I could not have scripted it any better!!! 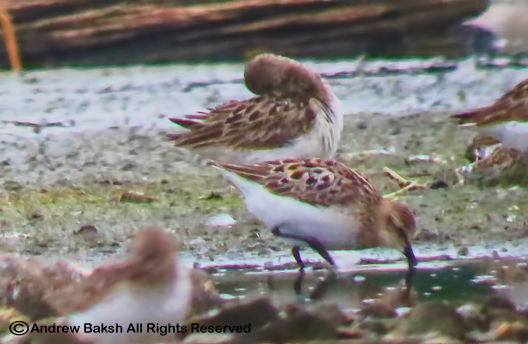 Here are a few photos from yesterday's second Ruff that was found on the East Pond at Jamaica Bay Wildlife Refuge in Queens NY. 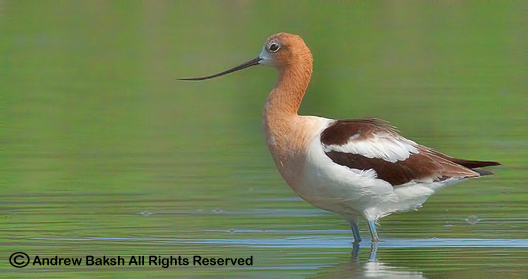 This one I nicknamed, "Rufous Ruff", because of all the rufous in its plumage. A very different individual than the White-headed Ruff from last Sunday. 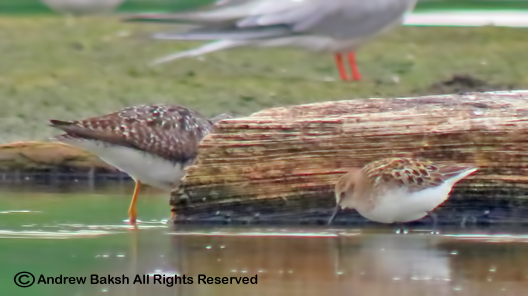 I am finalizing my post from Sunday's find, so that will be up soon with additional images of the first Ruff.